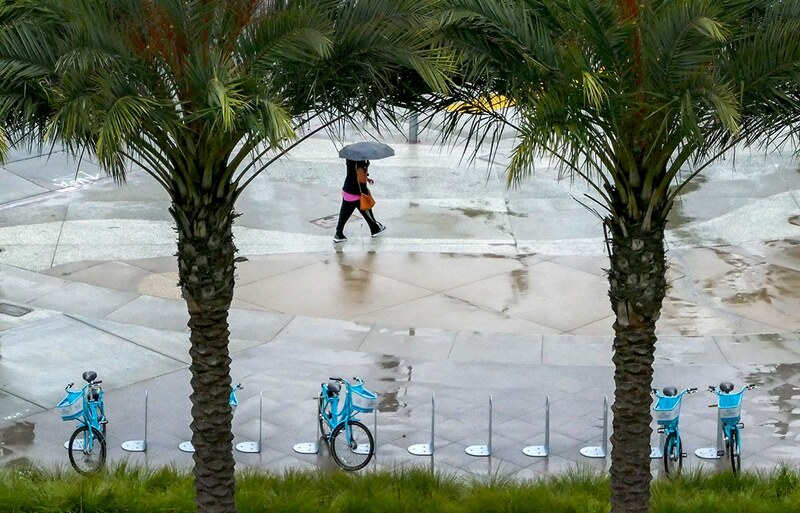 Rain is expected in Long Beach Wednesday night and Thursday morning. Photo by Thomas R Cordova. The only questions are how much rain? And will it wash Long Beach into the sea? “One to two inches total,” predicted Boldt, which is what he does for a living. And, Long Beach will get the bulk of it between 4 and 10 a.m. Thursday, following likely showers late afternoon or early evening today. The bigger, early-morning rains, sliding down to Long Beach from Northern California, will be worse in the local mountains and foothills, filling the Los Angeles and San Gabriel rivers, which will likely dump tons of garbage from inland cities onto the Long Beach strand. And Long Beach should be able to weather this one. Boldt doesn’t see much calamity coming from this storm, other than making your Thursday morning commute extra-maddening. Long Beach Fire Department’s Marine Safety Chief Gonzalo Medina said his department is taking precautions against possible storm-related problems, but he’s not overly concerned about this particular weather event. “There’s a significant surge coming in, but it’s tracking differently than some storms that have caused some local damage. We’ll be sheltered by Catalina Island.” And tonight’s high tide, at a little over 5 feet, is not perilously high. “We’re not anticipating a significant tidal problem,” said Medina. Crews, though, have been sent out to patrol the rivers and to warn people, particularly the homeless, to be aware of flash-flood dangers and fast-moving water. Councilwoman Suzie Price, whose 3rd District includes the waterfront communities of the Peninsula, Naples and Belmont Shore, also doesn’t anticipate too much damage from this storm, again because of the sheltering of Catalina. “Teams have been clearing drains, and we’ve reinforced the berm on the Peninsula,” she said. And those still worried about storm damage can get sandbags and sand at the 72nd Place lifeguard station at 7200 E. Ocean Blvd., and Lifeguard Headquarters at 2100 E. Ocean Blvd.